I would recommend you do this two weeks before your event. 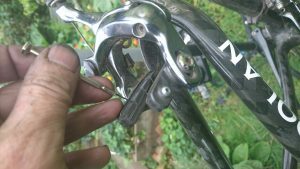 If anything is not working properly or is worn out you need to have time to either to fix it yourself or to book your bike in with your local tame bike mechanic. These are crucial to you having an enjoyable and safe sportive. Remove you wheels and check your brake pads. Most makes have a wear line on them. Most also have slits in the sides, if these have worn flat you need to change them. With disc brakes you will need to remove the spring clip holding the pads in place and remove them to check them. With disc brakes it is normally very obvious if the pads are worn…. Warning do not apply the brakes if you have hydraulic disc brakes with the wheels and pads out. With your wheel back on check that the brake pads are gripping the wheel at the same time not pushing one side first. If they aren’t even first check that the wheel is seated firmly and straight in the drop outs. If it is there is a small Allen key nut on the side of the brake calliper, which allows you to centre the pads. With your wheels removed go right round the tyre looking for flints or any objects embedded in the tyre. To remove any objects let some air out of the tyre and either use your nail or a small flat head screwdriver to flick them out. If you have any deep or large gashes in the tyre you should consider replacing it. If your side walls are damaged, have tears and are bulging they should be changed. If you don’t have a bike stand get a friend to hold your back wheel off the ground. So you can run through the gears. If you have shifting problems either book your bike in with your local bike shop/mechanic or you could have a look at the following excellent GCN videos and have a go yourself. There’s nothing worse than a dropped chain on the first hill……. It’s a simple thing but give the crank arms a good wiggle to see if there is any movement in the bottom bracket. If there is, then it’s off to the bike shop. Check your chain for wear either with a chain wear tool or by measuring 8 complete links which should be 8 inches. Another rough measure is if in the big ring you can pull the chain away from the teeth and expose a lot of the teeth your chain is on the way out. If you chain is worn out you should replace it as soon as possible. Is your bar tape worn, loose or just plain dirty? If so change it. If nothing else it will make you feel better at your sportive… Fundamentally it will make your ride more comfortable.